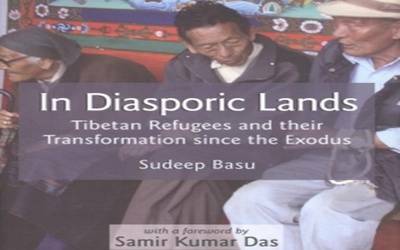 New Delhi, Oct 3 (IANS) Even in the face of "extraordinary pressure to assimilate with the host populations", Tibetans living in exile in India have been extremely successful in retaining their ancestral way of life, says Sudeep Basu, whose recent book "In Diasporic Lands", attempts to chart the story of Tibetan refugees and their transformation since the exodus. "The success is a result of a concerted effort on the part of the government of India and the Dharamsala administration to enable Tibetan refugees to preserve their culture and pursue economic activity against all odds," Basu, an Assistant Professor at the Centre for Studies in Social Management, Central University of Gujarat, told IANS in an interview. He contended that the creation of a series of permanent agricultural settlements throughout India in the initial years of refuge was a successful rehabilitation strategy. He also said that many Tibetans living in transit camps or working on road repair were resettled "within a period of five years" and became economically "self-sufficient". "Gradually, with greater education extended to Tibetans, many have moved out of these settlements into other occupations, exploring new possibilities among their hosts. In time, sweater-selling business, hotel business and tour operations, proved more lucrative and less time-consuming for the aspirational India-born Tibetans," he pointed out. His book is based on ethnographic fieldwork in Darjeeling and the author’s findings suggest that an uncertain future has not deterred Tibetans, refugees in Darjeeling since 1959, from achieving material and non-material success. "The point of consideration for the new generation in Darjeeling town has been the prospect, desirability and extent of participation in the affairs of the homeland, besides pursuing business and work-related ventures. Through public acts of mobilisation, Tibetan diasporic communities are seen to display their loyalty to the Tibetan cause and yet not antagonise their hosts through ostentatious display of wealth. Their act of restraint and a ‘non-violent’ disposition creates an amiable relation with host communities. This makes life in Darjeeling more bearable for them, but to achieve this requires constant negotiation and a balancing act," he said. In the book, Basu argues that places and identities are "redefined and transformed" by refugees negotiating their "belonging in an alien country" over time. Asked how, he shared an example, pointing out that nearly all Tibetan refugees in Darjeeling town under the Foreigners Registration Act have also obtained the Registration Certificate (RC) as an emphatic proof of their Tibetanness. "The RC remains one of the most powerful unifying symbols for the Tibetan exiles. Yet Tibetan refugees in Darjeeling town continue to identify themselves or are identified by others as Indian citizens, in certain contexts. It becomes difficult to distinguish between a façade and a reality, since refugees are unwilling to disclose how they identify themselves with others. This gives off the image that refugees ‘imagine’ themselves as being part of the host society or producing real or fictitious forms of cosmopolitan identity," Basu said. In the book, he also talks at length about the "lived meanings" that Tibetan refugees in Darjeeling attach to their life in exile and to the spaces they live and work in. He said that their strategies of living "without feeling the constraints of otherness" are vital to leading a dignified life. "The landscape of Darjeeling into which the Tibetans moved following the exodus was relatively close by and topographically not entirely dissimilar to Tibet… The re-creation of familiar features from the lost environment as recaptured in the architectural design of houses built in and around the refugee settlement, making of thangka paintings and handicrafts, rituals of naming houses and streets with their spatial and temporal symbolism, inner decoration of refugee homes with pictures of the Potala palace and the Dalai Lama, continue to provide meaning and purpose to refugee lives," Basu maintained. But while Tibetan refugees negotiate their lives in exile, what does Tibet as a homeland stand for them now? Basu said that the continuing traffic between Tibetans, both physical and on the internet, on both sides of the Himalayas and dispersed in the diaspora has produced an increased awareness among Tibetan refugees of the inter-connectedness of places. "Forced migration and the seeming impossibility of return to one’s home country have produced feelings of longing, despair and idealisation concerning Tibet and Tibetanness among Tibetans over time. The condition of protracted exile has also produced a ‘virtual Tibet’ through the proliferation of vibrant social media communications among lay Tibetans in Tibet and in the diaspora as well as the Tibetan government-in-exile," he said. According to the figures presented in the book (from the Tibetan Demographic Survey of 1998), 2,411 Tibetans live in Darjeeling town; 442 in Ghoom; 2,023 in Kalimpong; 447 in Kurseong; and 641 in Sonada. "In Diasporic Lands" is published by Orient Blackswan, and is priced at Rs 775.